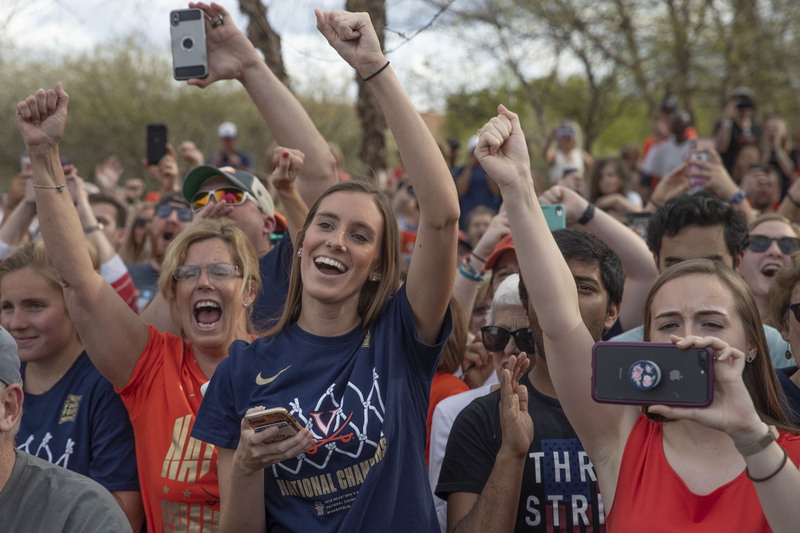 Cavalier fans came by the thousands Tuesday afternoon to the John Paul Jones Arena parking lot – many clad in freshly minted T-shirts of many designs, all declaring the University of Virginia Cavaliers to be the 2019 champions of college basketball. 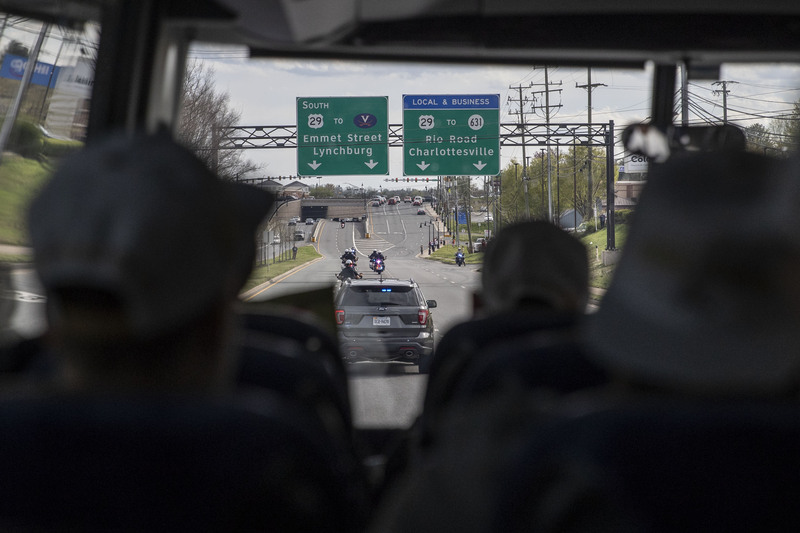 Still more lined the sides of U.S. 29, along the route from the Charlottesville-Albemarle Airport – where a water-cannon salute greeted the team’s charter flight – to the arena, waving to the UVA charter buses as they cruised behind a phalanx of police motorcycles. All were hoping just to catch a glimpse of the heroes they had breathlessly watched outlast a ferocious Texas Tech University team on television some 20 hours earlier. It was a scene you might expect to greet rock stars, or maybe the Queen of England. Co-workers Jeanne Landis and Vickie Sandifer took a half-day of vacation, making the hour’s drive from Lynchburg to be at the arena more than two hours before the team’s scheduled arrival. They nabbed prime spots along the barricades that led from the top of the parking lot to a stage on the plaza in front of the arena. Like most of the somewhat sleep-deprived fans in attendance, they had persevered through a third straight harrowing ending – and the second overtime game in the last three – before watching the confetti fall from the rafters of Minneapolis’ U.S. Bank Stadium a few minutes before midnight Monday, after the Hoos had pulled out an 85-77 victory. Likewise, Matilda Foster of Louisa County said she was “a nervous wreck” as she watched the game unfold from her bed. Judging from the number of families in the crowd, attendance may have been a little lighter in Virginia schools on Tuesday. 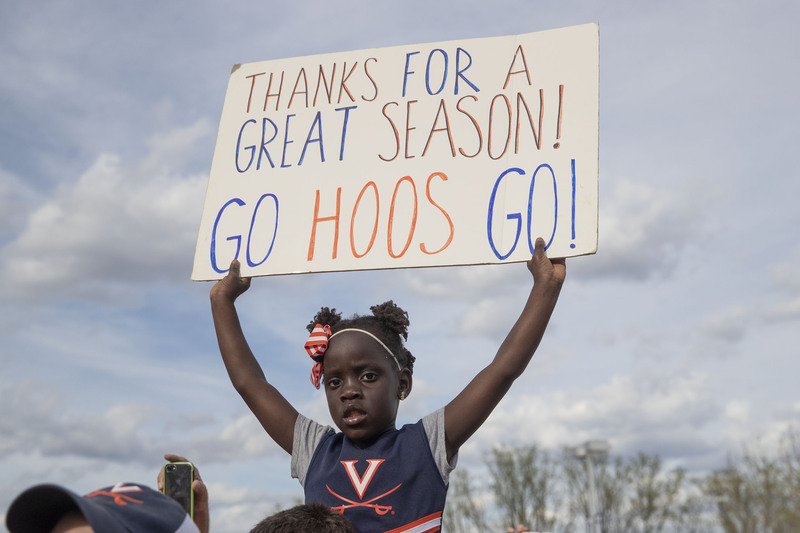 Hazel Mariano, a 1993 graduate of UVA’s School of Nursing, made the long trek from Virginia Beach with her husband and four of their five children (the fifth had an exam). “Today’s a holiday in the Mariano house,” she said. Likewise, Jessica Davis signed her children, Sierra and Maddox Mason, out of their Bedford County schools a little early on Tuesday so they could greet the team. The youths said the game had been a hot topic of conversation in the hallways, which they said are infested with many Virginia Tech fans. “They kept bringing up football,” Maddox Mason, 12, said. “And the double-dribble,” a reference to a referee’s controversial non-call that went UVA’s way in the national semifinal victory over Auburn University. Retired UVA employee Jim Cecil, 77, sat on his walker, hoping for a glimpse of the team. He’s also an alumnus, having graduated from UVA in 2009 from the School of Continuing and Professional Studies. Nearby, Shawn Long, 17, a special-needs student from Orange County, grinned in a freshly purchased orange-and-blue wig. “It’s my new style,” he said. “Who else shoots a three?” Shawn’s mom, Shawna, asked. The crowd continued to swell in anticipation of the team’s expected 4:45 arrival, lining up four- and five-deep along the barricaded chute. Roving TV camera operators prompted occasional outburst of cheering. Around 4:40, some energetic souls at the top of the parking lot started a “wave” cheer that finally made its way all the way down to the plaza. 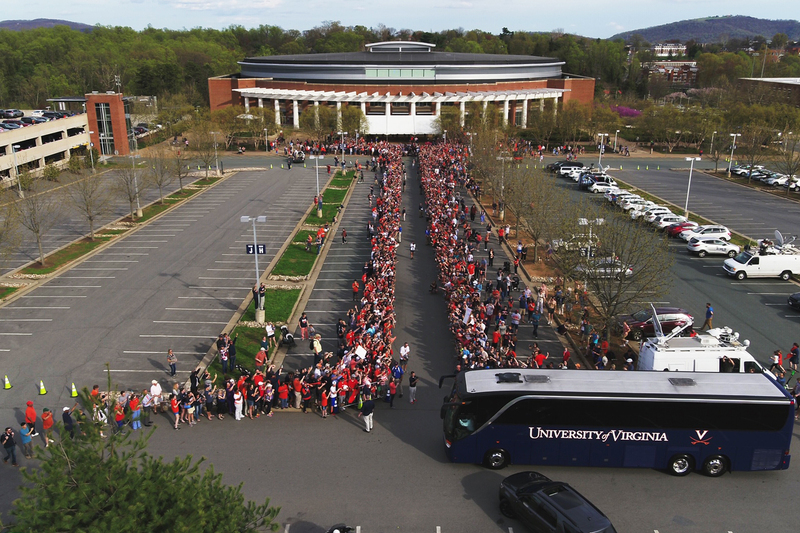 Finally around 5:20, the police escorts led the UVA charter buses up Massie Road and into the parking lot. 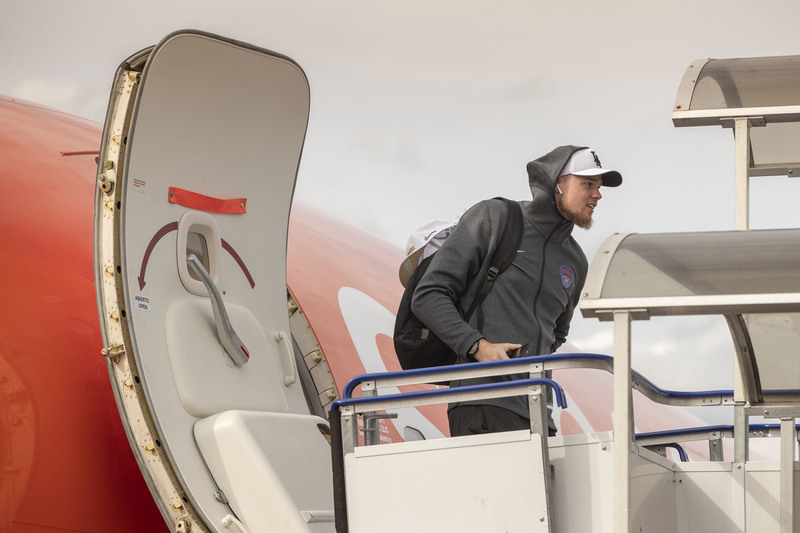 Soon, the team members debarked in twos and threes, many holding up their phones to capture video of the cheering fans, who held up their phones to get video of the players. Diakite emerged from the bus holding the championship trophy aloft, to a huge ovation. Fans greeted head coach Tony Bennett with a “Tony! Tony! Tony!” chant. The crescendo of cheers followed the players and coaches as they made their way down the parking lot to the stage. Koehn introduced Guy, the hero of the semifinal victory over Auburn, his three free throws with 0.6 seconds left propelling Virginia to the title game. Bennett followed Guy to the microphone. “I guess this really happened,” he said. “We really won the national championship. “I wanted it so bad for these guys, and the guys before,” he continued, specifically saluting fifth-year senior Jack Salt, whose collegiate career came to an end Monday night. 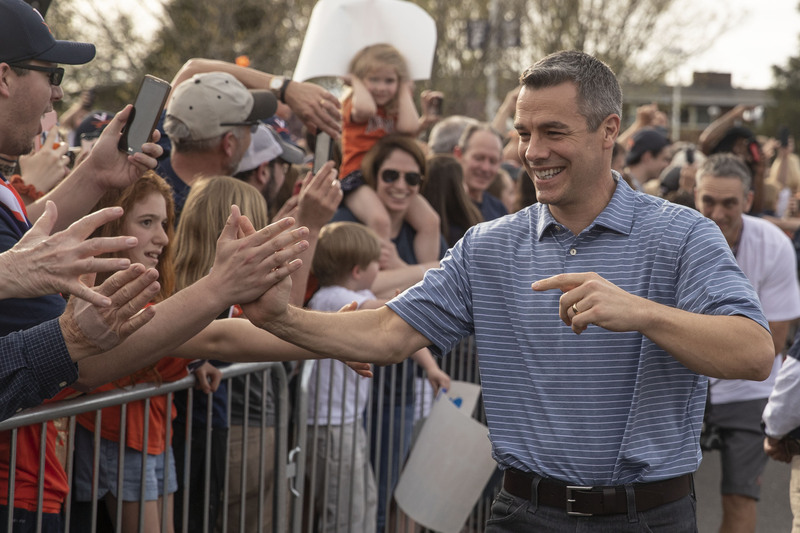 Koehn reminded the crowd that UVA will host a more extensive event to celebrate the team on Saturday at 2 p.m. at Scott Stadium, with gates opening at 12:45. Admission is free.